Coach Kang stands at the edge of his apartment window, pacing back and forth, attempting to make heads or tails of his current predicament. “Who do I keep from Frost and Blaze to redeem CJ Entus and reclaim its former glory? Coach Kang stands at the edge of his apartment window, pacing back and forth, attempting to make heads or tails of his current predicament. Running one hand through his hair, and the other through his phone contacts, he looks out at the Seoul cityscape, searching for an easy answer. With this brilliant new idea, he gazes back out into the evening sky, his eyes darting across the fading silhouettes of the sunset-lit skyscrapers, when he sees a white-and-blue flash on the horizon. He stares directly into the burning Flame, narrowing his eyes as if issuing a challenge. After a short while, the Flame becomes engulfed in a sea of red and takes off into the sunset, leaving Coach Kang to deal with the wrath of the mighty Emperor. The Emperor takes up his concerns with the puny Coach Kang, only to be met by the same piercing stare and the words “Stop DayDream-ing and take your talents elsewhere.” Thus, the Emperor packs his DayDream in a briefcase and journeys across the ocean, only to realize he left his entire armory of Gunza home alone. And with a Swift kick, Coach Kang boots the Gunza out into the street, laughing as he closes the door on CJ Entus Blaze. Both Blaze and Frost battled roster issues throughout Season 4, including, but certainly not limited to, Blaze losing its formidable bottom lane and Frost utilizing numerous untested junglers (following CloudTemplar’s transition from the booth to the desk). 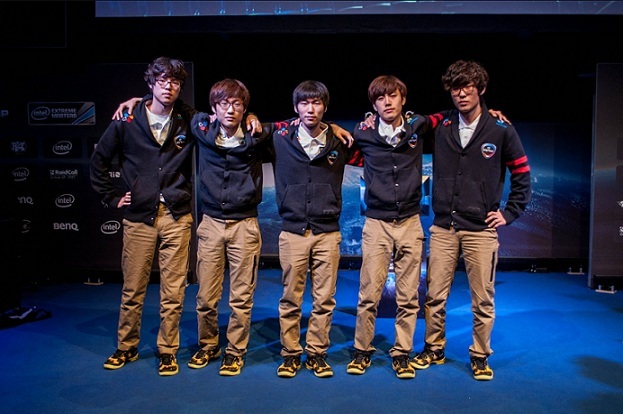 Coach Kang, and the rest of the CJ Entus coaching staff, were given yet another challenge coming into the 2015 Season, having to consolidate Blaze and Frost into a single, functional CJ Entus roster. Note that although the players competed on sister teams under the same organization, most of them had not previously played alongside each other in front of a live audience. CJ Entus has historically been known in League of Legends for their breathtaking teamfights, often turning horrible laning phases into victories within a matter of minutes. However, Frost depended on their former jungler, CloudTemplar, to control the flow and pace of the game, and Blaze turned to the duo of Helios and Ambition to continually call the shots. Two-thirds of these players have since departed from the CJ Entus organization, leaving the authority and structure of the two lineups in constant flux. shaky play throughout the majority of Season 4. He saw that a risk needed to be taken in order to bring CJ Entus back to the top, and boldly offered his services as a jungler, thus sacrificing years of mid lane knowledge and experience for the better of his organization. For two months after the initial announcement, Ambition woke up and played Lee Sin, Jarvan IV, and Rengar almost exclusively, deceiving many who looked at his profile expecting to find Twisted Fate and Yasuo all over the match history. In pretty much the entire preseason, Ambition looked lost and a bit impatient, many times turning his own counterganks into double kills for the enemy team, which could be a side effect of his being the only starter remaining from the storied Blaze. His vision control severely lacked any sort of consistency, only appearing once he had made his presence felt on the scoreboard, and contributed to weak performances in both the top and bottom lanes. Although Ambition looked solid in his mechanics on Jarvan IV, he showed room for improvement on the more popular picks of Lee Sin and Rengar. Come the regular season, however, Ambition stepped up his vision game tremendously, keeping CJ Entus well-focused and well-aware of every objective on the map. Compared to a preseason that saw CJ Entus only take a few dragons in total, the first two sets have shown that Ambition and the rest of the team have found a new synergy together, consistently controlling objectives with coordinated positioning and warding, thus impressing many who had written them off after their abysmal 2015 preview. Ambition appears to be gaining a lot of much-needed confidence, which, in turn, should provide a boost in shot-calling and team morale. play of his mid-laner, CoCo, formerly of Frost. One of the most underrated mid players in Korea, CoCo had been praised for his outstanding mechanical play on Jayce, LeBlanc, and Kassadin while on Frost, most of which has carried over quite well onto the new CJ Entus. In the few weeks we’ve seen him this year, he has showed impressive laning phases on Xerath and LeBlanc, working in some Lulu here and there. Whether his other lanes are playing well or playing poorly, CoCo always maintains a high minion count, so that he can stay relevant later in the game, which frees up Ambition to focus his efforts elsewhere. And when Ambition decides to visit the mid lane, CoCo has usually already blown one, if not both, of his opponent’s summoner spells, thus allowing Ambition a slight mechanical handicap if needed. historically sporting rather impressive Irelia performances, has seen his champion pool dwindle down to Kayle recently. Yes, he does play Kayle at a much higher level than most top laners nowadays, but CJ Entus sacrifices too much in order for Shy to feel comfortable. He struggled to gain any sort of advantage as Maokai or Kayle (weak laning, strong teamfight/late game), actually being harassed and bullied to the point of having to Teleport back to lane at inopportune times, many of which led to enemy dragon takeaways. More recently, however, Shy has begun to find success on champions closer to the current meta, such as Lulu, on which he has held his own against SKT T1’s MaRin and NaJin e-MFire’s Duke, and Dr. Mundo, with which Shy has been able to disrupt the enemy carries well enough for CoCo and Space to stay safe and do damage. Even though Shy has not been contributing the same damage numbers that he’s used to, he has admirably adapted to a more support-focused top lane meta, doing all he can to help his team succeed. lane and positioning poorly in teamfights. MadLife also had to deal with a evolving support meta that favored poke- and sustain-oriented characters rather than the playmaking displacement champions that brought MadLife’s name into everyday conversation. Humble and driven, MadLife attempted to bring the same energy and confidence onto Janna and Nami, only to be caught out while warding and burn his Flash in the process. Fortunately for our beloved hero, however, his partner-in-crime Space has stepped up his game tremendously coming into the 2015 season. Space struggled on the skirmish-friendly Lucian in Season 4, and looked nearly as uncomfortable on his Ezreal and Tristana in the preseason, leaving many fans to question their loyalty to the CJ Entus organization. The first two sets of LCK Spring 2015, though, have shown promise in favor of a renewed Space. His Sivir gameplay helped him rack up a 20.00 KDA, and although the numbers are slightly dimmed now as a result of an unsuccessful Kalista pick, he and MadLife appear to be on the same page again in terms of trading, laning, and looking out for one another. Space’s increased focus on positioning has also made MadLife’s job much easier, leaving him to worry less about his lane partner and more about macro-level details, such as warding objectives and pressuring other lanes. Are they the real deal? CJ Entus is in no way out of the woods yet, but each individual member has begun to show up in a way that is beneficial to the team as a whole, creating hope for redemption of the organization in Korean League of Legends. Tune in on January 21st (1AM PST) to see the revitalized CJ Entus take on a KT Rolster lineup that can’t yet get off the ground! Broadcast will be shown live on either twitch.tv/riotgames or twitch.tv/riotgames2.